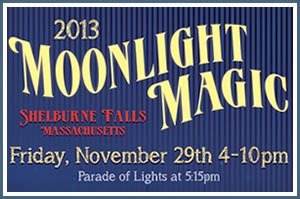 On Friday, November 29th, starting at 4:00 PM, the annual Moonlight Magic in Shelburne Falls will be kicking off the holiday season! Join us for the lighting of the Village where stores, galleries and restaurants will stay open late for special holiday promotions. Vendors will be offering a rich assortment of items, including baked goods, crafts, delicious food, hot drinks and entertainment! At 5:15pm, the annual Parade of Lights will cross over the Iron Bridge spanning across the Deerfield River from Buckland to Shelburne. Mole Hollow Candle Co. will again be providing 1,200 luminary candles which will line both sides of the streets throughout the village as Santa, the Grinch, the Snow Princess, Sparky the Fire Dog and many more make their way through town. Many local vocalists and instrumental groups will perform at designated sites and roaming along the streets. To date, some of the artists that will be performing will be: The Magic Guy, Uncle Hal's Crabgrass Band, Violet's Musical Saw, and the Expandable Brass Band! At Memorial Hall Theater, children and their families can watch cartoons on the big screen from 5:30-8:00 pm courtesy of the Memorial Hall Association. The Shelburne Falls Women's Club will hold their annual cookie shop at the Visitor's Center and Santa's Workshop will be in full swing at the Shelburne-Buckland Senior Center.